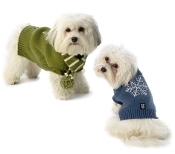 This snowflake dog sweater is the perfect choice to keep your best friend warm this winter. It is a great combination of high fashion, style and functionality. This snowflake embroidered turtleneck sweater features double weight ribbed sleeves and a fold down ribbed neck. This sweater comes with an adorable striped scarf to complete the look! The striped scarf features pom-pom loops through one end for an easy on/off.